Lately, I've been hearing a lot of positive feedback from people who have used coconut oil, topically, as a beauty treatment. In fact, a good friend of mine in Florida informed me that she has been using coconut oil and found the results quite amazing. So, about two weeks ago I decided to purchase a jar from the company, Spectrum, which I found at a vitamin store I frequently shop in. Not only have I been using it on my face and body, but also my scalp, hair, and cuticles. And I've got to say....my friend was right, the results were amazing! 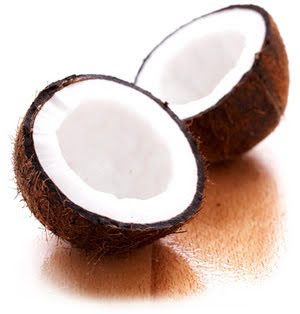 Coconut oil has been used as skin care, beauty and hair products for many centuries in the Far East. Coconut oil can provide moisturizing benefits for the skin and is, without any comparison, an excellent hair conditioner. These days coconut oil is used as an ingredient for making skin care products, hair treatments, and body and sun protection lotions. Coconut Oil is rich in antioxidant nutrients and has the highest content of Lauric Acid up to 57% and can provide fantastic benefits on making your skin younger and hair looking healthy and shiny. Coconut oil will absorb easily, keep the skin soft, and yet without feeling greasy. *Applied topically helps to form a chemical barrier on the skin to ward of infection. *Reduces symptoms associated the psoriasis, eczema, and dermatitis. *Supports the natural chemical balance of the skin. *Softens skin and helps relieve dryness and flaking. *Prevents wrinkles, sagging skin, and age spots. *Promotes healthy looking hair and complexion. *Provides protection from damaging effects of ultraviolet radiation from the sun. 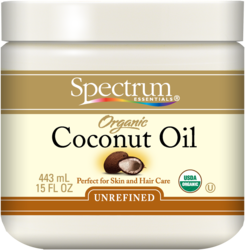 So, if you’re looking for an excellent skin and hair beauty treatment, that is inexpensive and extremely effective, I can highly recommend, Spectrum Coconut Oil for Hair and Body.